Thursday, we drove nine hours to Maun, at the edge of the vast Okavango Delta. On the way, we stopped for lunch at the side of the road. When we were packing up, we saw a figure in the distance walking down the desolate road towards us. He was carrying a backpack, and as he approached, we could see that it was an independent traveler named Joe we had met while waiting at an ATM in Mzuzu, Malawi three weeks earlier. It is common to run into the same travelers multiple times, as most people tend to follow similar routes, but this instance was just bizarre since it was in the middle of nowhere. Joe talked to us for a while and then waved down a car and was off again. 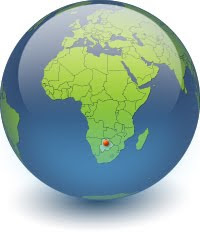 Africa does not have a good public transportation network, and some areas have no public transportation at all, so I admire Joe's bravery in tackling Africa alone – it seems like it would be quite an adventure. I will soon have a taste of independent travel myself when I arrive in Asia in six weeks. But for now, I'm enjoying the convenience and companionship that goes along with the Oasis truck. An aerial view reveals trails created by hippos and other animals as they move through the Okavango Delta in Botswana. The largest inland delta in the world, the Okavango is a veritable promised land for a medley of wildlife across Africa. During the rainy season, water pours into the grasslands from the mountains to the north, turning the area into a lush and vibrant delta – the perfect ecosystem for parched animals that trek vast distances from arid lands to this watery paradise. The face of the delta is scarred by a vast web of trails created by these animals as they trudge through the wetlands. Humans also create trails through the long grass with mokoros, dugout canoes used by the local people. On Friday morning, eight of us set out for a two-night mokoro expedition into the wilds of the Okavango. We rode a couple of hours in a truck to the edge of the delta, where we met our mokoro guides. After our tents and camping supplies were loaded into a few support mokoros, we climbed into the boats ourselves – two to a mokoro. I leaned back on my pack and pillow and relaxed as we slowly floated through the reeds. The guides drive the mokoros using long poles, which they push into the silty ground only a few feet underwater. It was a unique perspective to be so close to the water's surface, and I could reach out and touch the thousands of water lilies that rested delicately on the mirror-still surface. It was tempting to shut my eyes, but it was difficult to sleep because every few minutes a long wet reed would drag across my face. After an hour or two, our guide pushed his pole hard into the delta floor, and we scooted up onto a bank. We had reached our campsite. 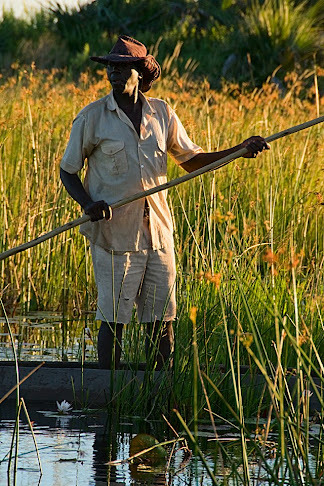 A poler guides his mokoro through the Okavango Delta in Botswana. It was in the middle of nowhere, the most isolated place I had been in Africa. We were truly out in the bush. As we set up our tents under the shade of trees, Joe, the independent traveler we had seen walking down the road yesterday, walked out from behind a bush! It turned out that our campsite had another entrance from the mokoro trail, and Joe had hired a private guide for his own delta trip. Nevertheless, it was quite hilarious and random to see Joe in the middle of the Okavango. He hung out with us the rest of the afternoon while we lounged around the campsite. In the late afternoon, we climbed back into the mokoros and set out for one of the larger islands for a bush walk. We didn't see any animals, but when we were almost an hour from our mokoros, the sky darkened and we could see that a storm was coming. The delta is so flat that we could see black clouds leaking torrential downpours from quite a distance. We turned around and headed back to the mokoros, looking over our shoulders at one of the storm clouds that was quickly approaching us. We were literally being chased by the massive column of rain, and it barely caught up to us just when we reached the water. We hopped in the boats and the guides quickly poled us back to camp. Luckily, we escaped the bulk of the rain. That night, I fell asleep to the gentle patter of raindrops on the tent and the rhythmic chirping of thousands of frogs echoing through the darkness. The next morning, we awoke before the sun for an early morning bush walk. We ate a quick breakfast of peanut butter sandwiches – a staple on this trip – and climbed into the mokoros again. When we arrived at the island, the sun was just appearing above the horizon, brilliantly reflected in the still water of the delta. The rain from last night had remained as dew on the vast fields that surrounded us, and, strongly backlit by the early morning sun, the long grasses and flowers looked like delicate strands of crystal. We saw a few animals – a chameleon, several types of frogs, fire-engine red dragonflies, and a jackal – but one of the most interesting sightings was a crop of elegant glass-like mushrooms that had sprouted in elephant dung. I was having such a fantastic time photographing all the botanical curiosities encrusted in jewel-like dew that I didn't mind not seeing any elephants or giraffes. As the sun rose higher in the sky, the heat dried the dew from the grasses and the magical frost-like fields were soon dull again. 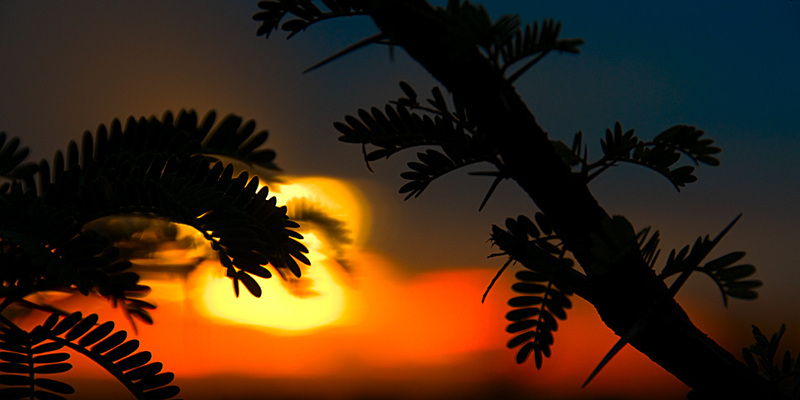 The thorns and leaves of an acacia tree are silhouetted at sunrise in the Okavango Delta, Botswana. Delicate mushrooms growing in elephant dung are illuminated by morning light in the Okavango Delta, Botswana. A chameleon crawls up a branch in the Okavango Delta, Botswana. We had the rest of the day free back at camp, so we decided to cool off by swimming in the delta – there was a "swimming hole" next to camp that was too shallow for hippos. The water was freezing cold, but it was a unique experience to feel the soft silt between my toes and be surrounded by water lilies. After my swim, I walked the short trail back to camp, and one of the guys from our group followed about ten minutes later, saying that he had just seen a black mamba slither into the bush beside the trail! Not that there's ever a good time to be bitten by a black mamba (some call it the five-minute snake), but it was unnerving to consider that we were hours from civilization. In the evening, we set out yet again in the mokoros to a large open lake, where we were entranced by the vibrant pinks and oranges of the sunset mirrored in the perfectly still water. As we climbed out of the mokoros onto the muddy bank at the campsite, the nearby reeds twinkled in the dim twilight with hundreds of fireflies. As darkness fell, the stars shone more brilliantly than I thought possible, the Milky Way blazing across the delta sky like a sparkling, star-studded rainbow in the blackness. 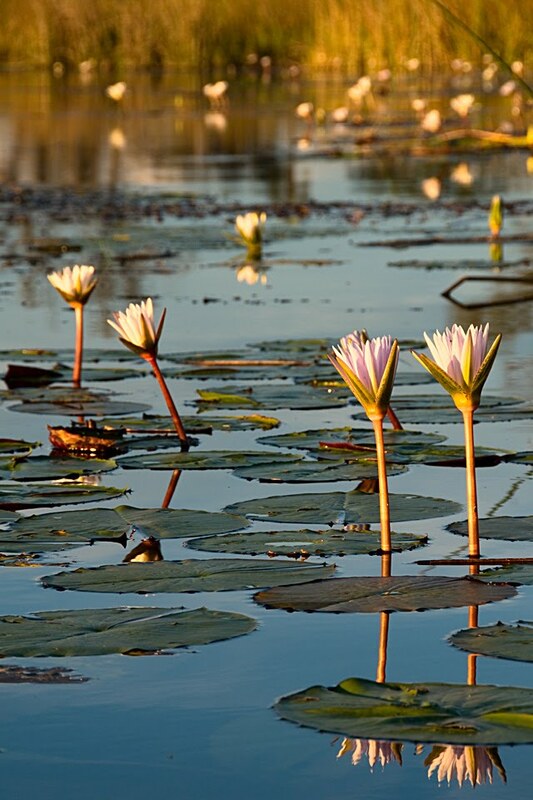 Water lilies reflect in still water at sunset in the Okavango Delta, Botswana. After our second night bush camping in the Okavango, we had one final walk this morning. Unfortunately, we didn't see any animals, and it was too dry for the crystalline dew that was so magical yesterday morning. We floated back to camp, packed our supplies and ourselves into the mokoros, and proceeded back to the edge of the delta where we met our vehicle. After a bumpy ride back to Maun, we had a few hours to relax before we had to make our way to Maun Airport for another perspective on the Okavango Delta. The airport was a desolate, dingy building that seemed more like a small bus station than an airport. Fourteen of us were going on a scenic flight over the delta, and we split up into two seven-seater planes. I was able to sit in front with the pilot, which was a really cool experience, but I was paranoid that I might accidentally bump some vital control. We took off, and soon all signs of civilization on the ground had given way to the unfathomably enormous wetlands of the Okavango. From the air, the mokoro trails looked like ant trails, and the pancake-flat vastness of the delta could be better appreciated. We dodged in and out of rainstorms, the plane bouncing and water leaking through the top seal of the windshield. We emerged from the turbulence and the pilot suddenly tilted the plane on its side – we were looking straight down through the side windows at the ground below. There was a herd of elephants on an epic journey through the wetlands. We leveled out, and as I looked closer, I could make out many different groups of animals – buffalo, elephants, hippos – drinking or bathing in the delta. Termite mounds punctuated the grasslands like massive earthen spikes. The intricate patterns created by water-logged animal trails, mirror-like lakes, and verdant clumps of water lilies formed a marshy Eden of sublime beauty. Back on Earth, we drove back to the campsite, awed by what we had just seen and humbled by the sheer enormity of the majestic Okavango Delta. This being Africa, such lush, watery beauty comes at a price: I counted 72 mosquito bites on just one foot.